Today’s post was written by Aleksandr Gelfand, adjunct curator at the New York University Archives. A special issue of NYU’s Washington Square Journal from 1960 features Heiss on the front cover. 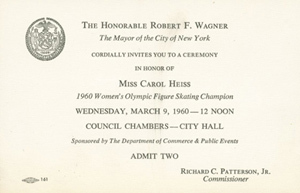 Ticket to the City Hall ceremony honoring Carol Heiss. New York University Archives, Carol Heiss biographical file. 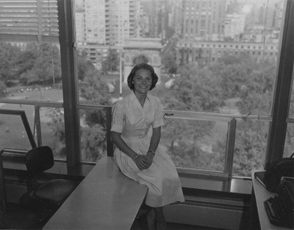 Carol Heiss posing in the former Loeb Student Center, overlooking Washington Square Park. New York University Archives, Photograph Collection. In 1956, Carol Heiss, a 16-year-old from Ozone Park, Queens, traveled to Italy to compete in the Winter Olympics. Heiss won a silver medal in figure skating, but her victory was colored by tragedy later that year when her mother, who always accompanied her during competitions, died of cancer. Before her death, Mrs. Heiss made her daughter promise that she would not become a professional skater before she had won an Olympic gold medal. 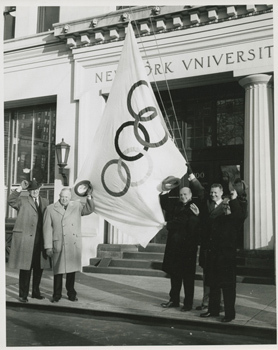 Some time after, as she trained for the 1960 Winter Olympics, Heiss enrolled at NYU’s College of Arts and Science, where she majored in English. At the 1960 Winter Olympics, held in February at Squaw Valley, California, Heiss went on to win a gold medal in figure skating. It was the first gold medal for the U.S. at those games. She was awarded first place by every judge at the competition. Dubbed “America’s own ice princess” by The New York Times, she became one of America’s most popular Olympic athletes. Upon her triumphant return, the city held a ticker tape parade up Broadway, attracting a crowd of 250,000 admirers, after which she received an award from Mayor Robert F. Wagner at City Hall. On March 10th she was welcomed at NYU by a crowd of students, alumni and faculty at a reception held in the Loeb Student Center. 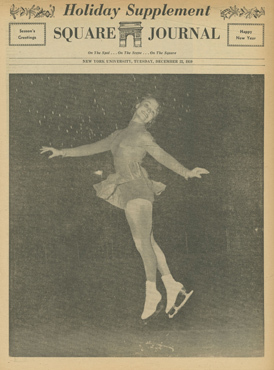 A few weeks after her return, Heiss married the 1956 men’s Olympic figure skating champion Hayes Alan Jenkins and left the University to pursue a professional career in skating. She was inducted into the New York University Athletics Hall of Fame in 2012.